Internet Protocol (IP) defines how computers communicate over a network. IPv4 contains just over 4 billion unique IP addresses, which were completely allocated to specific geographic regions on February 3, 2011. As the Internet transitions, organizations must adopt IPv6 to support future business continuity, growth, and global expansion. Organizations which choose to react to address exhaustion will find their customer base shrinking. It will be more difficult to innovate and more resources will be needed to sustain IPv4 investments. It's best to be proactive. 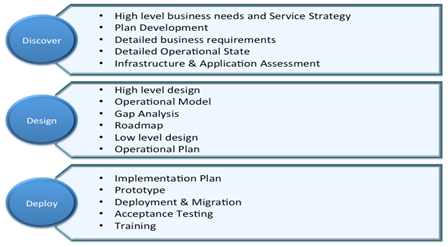 In2IT's DDD (Discover, Design, Deploy) framework offers a comprehensive solution towards solving the dilemma of organizations who are perplexed with the complexity of their IT assets and are not sure what should be the first step.